Blogarticle "FRP with Angular and Sodium"
I've used Angular too, but with the included RxJS. I like Sodium much more, but I wasn't sure whether extra code of I/O between Rx and Sodium would be worth it. I'm rather looking at some framework that would combine F#, Sodium and HTML together. I've had something working, but that was server side generated HTML (.NET ASP). Something that would work with it on the client side would be cool. 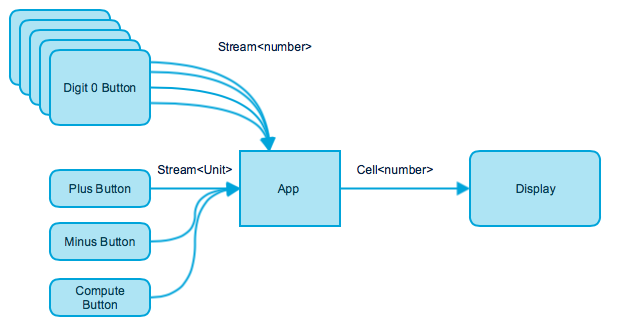 I'm thinking about websockets communication for sending Cellls and Streams over network. I managed to get this working between my WebAPI server and UWA client. We have the some discussions in our company. Sodium looks much cleaner, but RX is just already integrated in the web frameworks. And, of course, we have some colleagues who are pretty cautious in regards to this new functional stuff.